Triple MuxCo Somerset has applied for a change of frequency for its forthcoming DAB digital radio multiplex serving Somerset. Under the proposals, the multiplex would be assigned VHF Block 10B instead of 10D from September 2014. Proposed coverage at launch would not be impacted, and as the multiplex isn't yet operational, the change of frequency won't impact listeners retuning. Assessing the application, Ofcom said: "The frequency change requested by MuxCo is part of proposed revisions to the local DAB frequency plan which seek to enhance the coverage of local DAB services across the UK as a whole. As such, the proposed alternative frequency (10B) is available, and it appears to Ofcom that the knock-on implications for other multiplexes are likely to be positive, in that changing the frequency of the Somerset local radio multiplex service will reduce the levels of interference between local DAB multiplexes on the same frequencies and thus improve local DAB coverage overall." 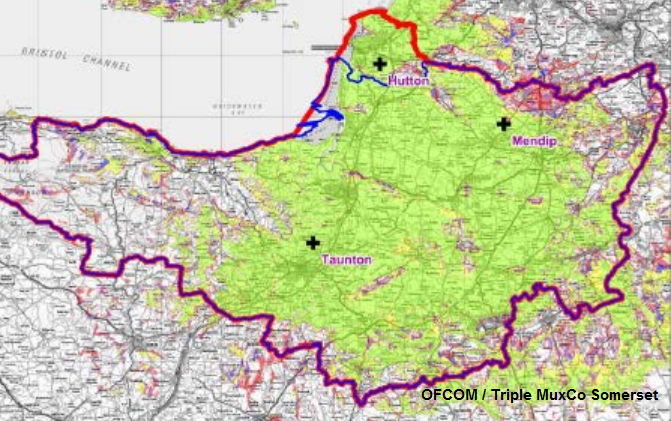 Triple MuxCo Somerset proposed to launch the multiplex from three sites: Hutton, Mendip and Taunton, resulting in a launch coverage of 216,758 households or 74.5% of households in the Somerset editorial area. Under its statutory obligations, Ofcom has opened the multiplex frequency change request to public consultation until 29th August 2014, where further details about the proposed transmitter sites can be found. On Monday 4th August, Pirate 2 launched on DAB digital radio, replacing the full simulcast of Pirate FM. Pirate 2 broadcasts specialist opt-out shows weeknights at 7pm. Power supply problems at Belmont - Lincolnshire's main transmitter - resulted in commercial radio in the county being wiped off air for several hours during Wednesday. Lincs FM, Classic FM and commercial DAB was off from just after 8am until mid-afternoon. The BBC's transmissions stayed on-air thanks to back-up power generators. During July, Smooth Radio and The Arrow (which took the ex-Real Radio Wales slot) moved satellite transponders. They now broadcast alongside Global Radio stablemates Capital, Gold and XFM, plus Heart TV and Capital TV on Eutelsat 28A (Frequency: 11582 (Horizontal Polarisation), Symbol Rate: 22000, FEC:5/6). Only LBC, LBC News and Heart (Radio) are separated from the rest of Global Radio's services on satellite on frequency 11222 (Horizontal Polarisation). While the change happened last month (and went unnoticed by most Sky and Freesat users, thanks to updates to the satellite TV provider's Electronic Programme Guides), anyone still missing these channels should reboot their satellite receiver. Freesat receivers can be re-scanned as a last resort. Ashburton, Bampton, Beer, Brixham, Dartmouth, Slapton, Sidmouth, Okehampton & Budleigh Salterton are all down as "phase 4" BBC DAB transmitters. These are all due to get the BBC's national radio stations on DAB by the end of next year. a516digital has now been told that DAB antenna have appeared on Okehampton's TV and radio relay mast, which will plug a reception hole in the middle of Devon including parts of the A30. There's been no indication as to when the go-live date is. 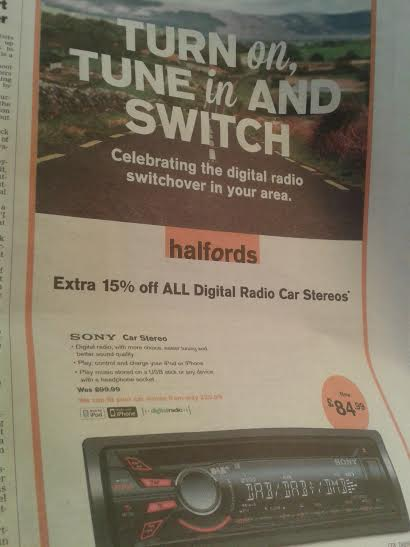 Halfords has marked the "digital radio switchover" in Derbyshire. Here's a hastily taken shot of a photo that appeared in the local newspaper on the day local DAB digital radio launched last month.